The Nancy Foster is a NOAA research vessel that frequently collaborates with multiple parties – universities, state agencies, and federal managers. By working together and pooling resources, a ship like the Nancy Foster, can synergize the work of a number of connected scientists. On the current cruise we have several scientists from the Florida Fish and Wildlife Conservation Commission, Florida Keys National Marine Sanctuary (FKNMS), National Center for Coastal Ocean Sciences (NCCOS), and the Office of Marine and Aviation Operations (OMAO). Their fascinating and important work will help us better understand the way marine populations work. You may have heard the saying there’s more than one fish in the sea. While certainly this is true, the aphorism does little to describe the condition of the sea. The assumption might be that because there are a large number of fish, the sea is a healthy one. But are the individual types of fish occurring in significant populations? Are the populations equally distributed or are they more likely in certain parts of the ocean? How do they change over time? There are many things we don’t yet know about the territory, movement, and reproduction of even our most important fish. 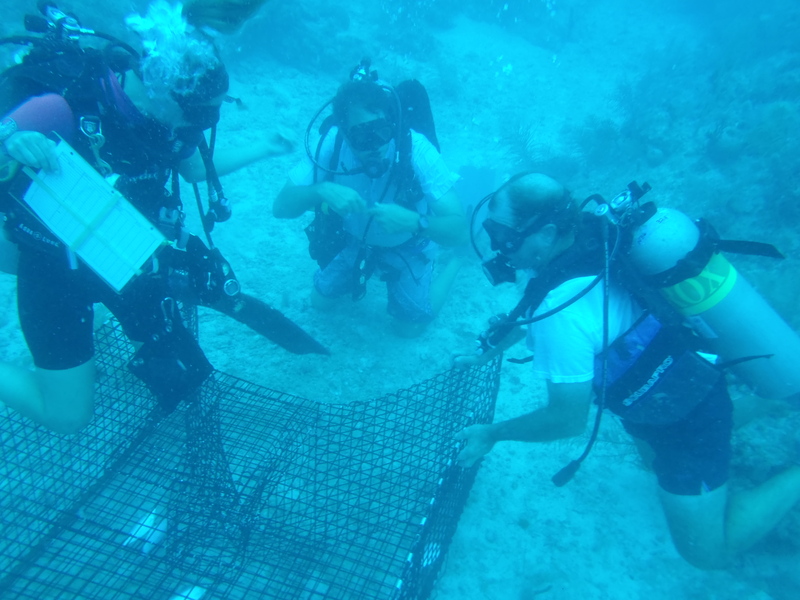 With the acoustic tracking project, we hope to find out how species of fish use the diverse habitats in the Florida Keys. It would be hard to follow a black grouper around 24/7. The logistics would be very difficult to work out, to say the least. Rather than following one fish, the acoustic tracking project tags fishes in the study area with what is called an acoustic tag. Acoustic tag which will be activated and implanted in study subject. Once fish are captured, they receive a small “surgery” during which one of the tags is implanted. This, in and of itself, does nothing. The tags can be customized for the characteristics of different species or needs of the study. For a habitat study, the tag might ping several times a minute while a longer project looking at movement between areas might be set to ping once every few minutes. The longer frequency extends the life of the tag. If a tag pings in the ocean, does it make a sound? The second part to the acoustic tracking is setting up and maintaining the listening probes called VR2s. Throughout the Keys and the Dry Tortugas, VR2 probes quietly wait for these pings and nonchalantly record the fish’s visit for later analysis. Think about the smartphone app Foursquare (is that a thing anymore?). Each time a fish swims near a VR2 its presence and visit duration is recorded and time stamped. Every 6 months to a year, the VR2 recorders have to be collected and analyzed. Each VR2 is a record of every tagged fish that came within a certain distance of the probe over the period of time it was collecting data. This is where our mission comes in. On our cruise, we are servicing a number of these probes; picking up the old ones, replacing batteries, downloading data sets, and placing new or rejuvenated VR2s. The VR2 receiver gather data from tagged individuals within the study area. The VR2 records the identification number, time, and date of each visit by a tagged specimen. Dive teams go out from the Nancy Foster, using only the GPS coordinates, to recover the sensors from the unmarked expanses of ocean. This process can be tricky due to variables such as currents, weather, and the inevitable equipment glitches. A clouded over satellite, a misread latitude, or a tipped over stand make this otherwise fun diving job challenging at times. On day 2 of our cruise we serviced several of these probes. We took a small dive boat out to sets of coordinates where a VR2 had been placed on previous missions. From there our dive teams went down with the new VR2s and came back with the old. Once the used probes are brought to the lab, the data is moved to a computer for analysis. From here we can map the fishes’ activities by tying the location of the VR2s to a geocoded map created by the bathymetric maps generated by the hydrography crew (I’ll write about that later). One additional point of interest is that the unique tag ID that each fish gets is searchable by other marine researchers in similar projects around the world. 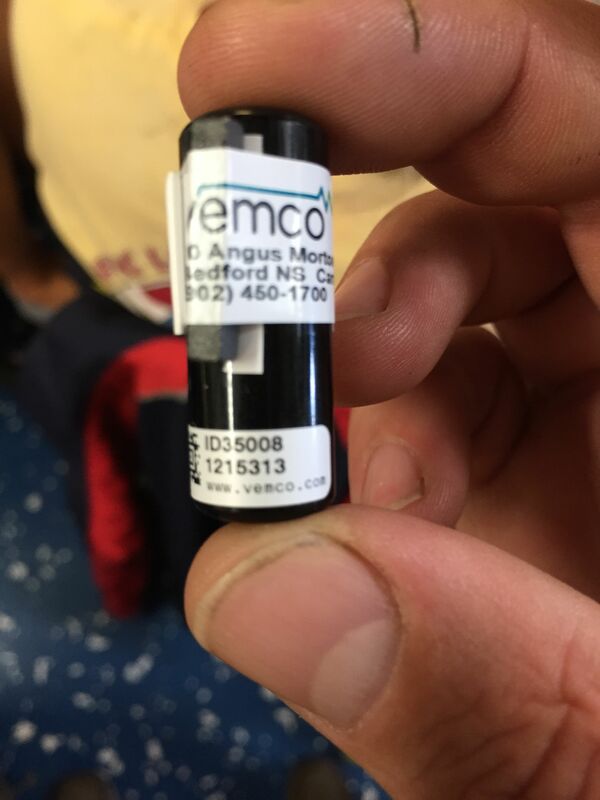 We can identify fish tagged from other projects that happen to travel, migrate or wander this way and our fish from the Keys can be located by others. locations. 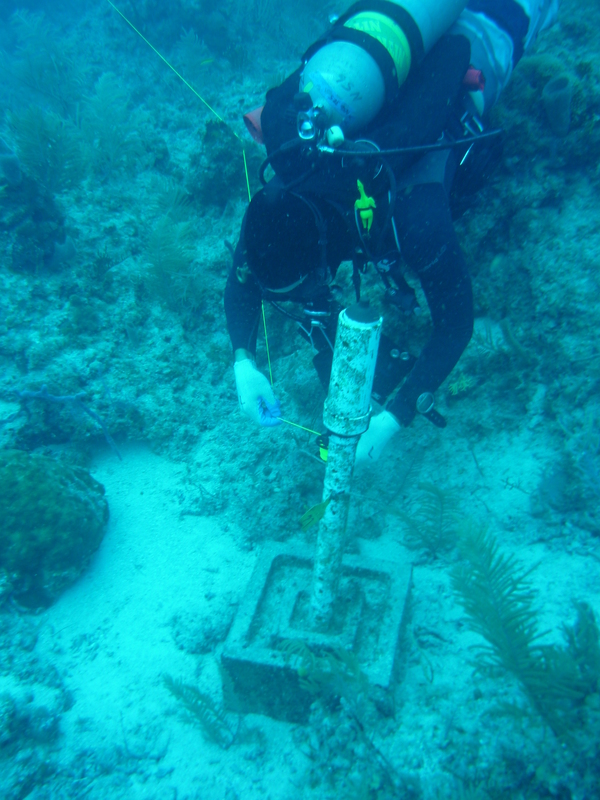 These are specially designed devices that have been approved by the Florida Keys National Marine Sanctuary specifically for this research project. Commercial or recreational trapping of fish has been banned for over 20 years. Remember the tagged fish? 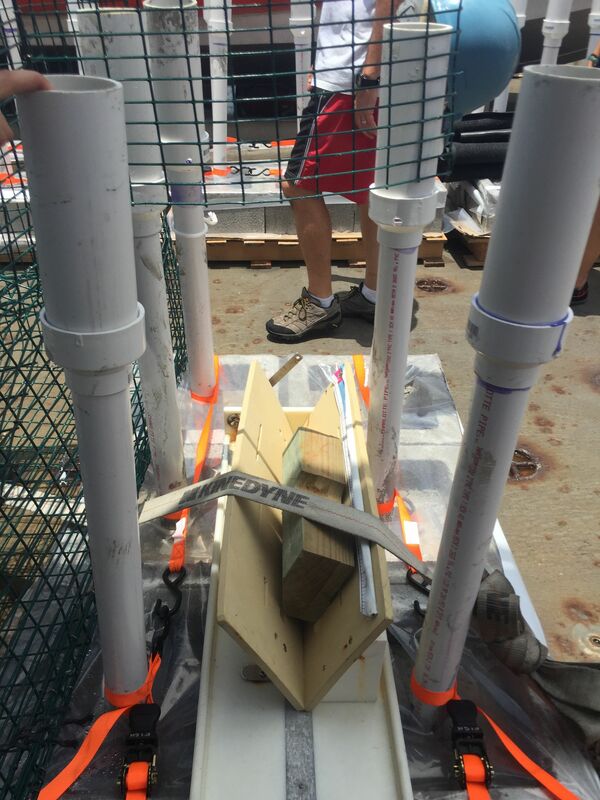 With these traps we hope to catch some grouper and snapper, key fish species in the Keys ecosystem. Once caught in these baited traps the fish may receive a transmitter to begin their role in the study. While it is easier for humans to do surgery on the surface, it is easier for the fish if it is done in the water. Amazingly, most of the implantations are done at the trap site, sometimes up to 100 feet deep! 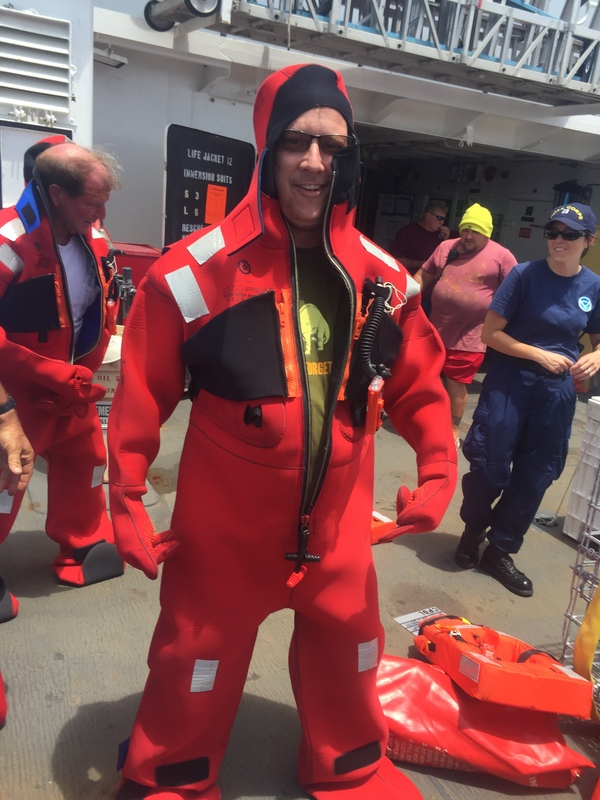 This is the emergency gear affectionately referred to as a Gumby Suit. I have to admit, for someone like me, it is hard to be the green horn. Most of the folks I know can piece together a picture of what working and living at sea would be like. I thought I had a pretty good mental collage going from my bits and pieces and random trivia knowledge. My maritime fantasy world was made of concepts and ideas from many experiences, books, friends and the like. Most of these are small snippets of truths that are sprinkled through all our memories. Drawers opening and closing with the rolling of the waves, portholes, the bustling mess at supper, escape hatches, smoke stacks, life rings. When I heard the “All aboard that’s coming aboard” as we prepared to leave port, the primeval neurons of my childhood sparked. I realized most of my snippets were from Popeye. Ak ak ak ak ak. Passing note, tonight’s wonderful dinner included spinach. The NOAA Commissioned Officer Corps is the smallest of the 7 uniformed services of the United States with just over 300 service members. It is eclipsed by the second smallest service, the United States Public Health Service, which has over 6000 officers. The Nancy Foster has a Facebook page! Like it and follow her amazing adventures. 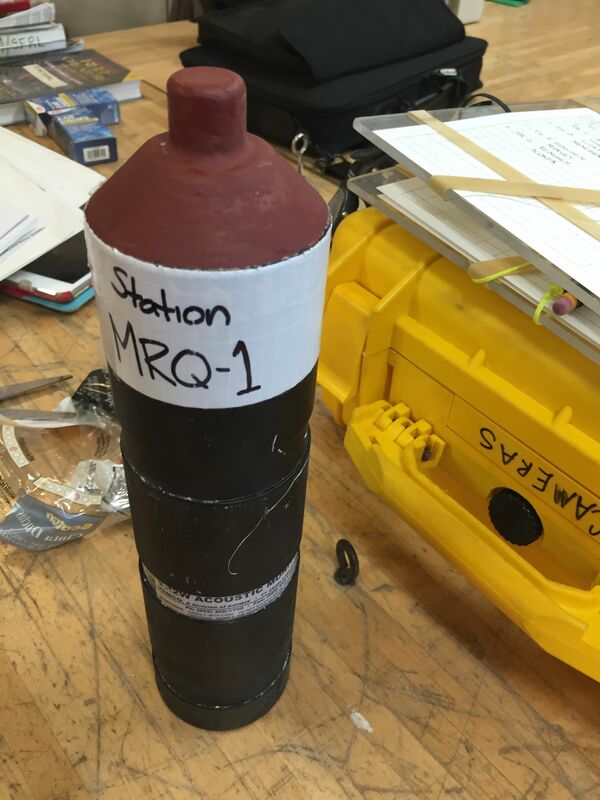 This entry was posted in 2015, National Marine Sanctuary, NOAA Ocean Service, NOAA Teacher at Sea, William Henske and tagged acoustic tagging, FKNMS, Florida Fish and Wildlife Conservation Commission, Florida Keys National Marine Sanctuary, Nancy Foster, National Center for Coastal Ocean Science, NCCOS, NOAA, Office of Marine and Aviation Operations, OMAO. Bookmark the permalink. A fascinating expedition! Very informative post! Bill I am so envious of you as well at being more proud of you. Sounds like you’re having a swimming good time…Tell us what you personally are doing…. I get to pitch in on all of the research going on on the ship, for example, this morning and this after noon I am helping keep the dive logs on our VR2 replacement trips. I help out with the dive crews, as I am not certified or permitted to dive as a part of the program. I work with other scientists with their equipment and set up and ask a ton of questions! When there’s down time there is a fitness room (the old torpedo room) and a fairly posh lounge with hundreds of movies on dvd and satellite television. We have lots of games on board and one of the scientists has started a knitting circle. We also save time for safety drills- Fire, Man Overboard, and the dreaded Abandon Ship.